Alyssa Karise is here! And her blanket is ready to send! Here’s the finished blanket. It’s actually a rectangle, but I wanted the message to be in the picture, reading from the top to bottom, left to right, so the perspective warps it a little. I used Base 5 math to code a message into the blanket, which I explained when I started. But now I can show you how it worked out. You can see in the picture above that the blanket makes a sort of grid. 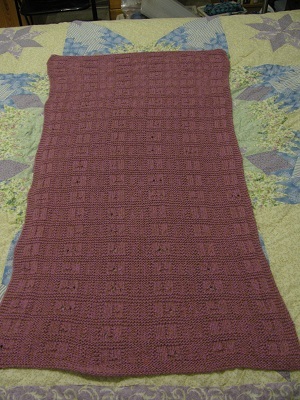 The “smooth” squares in the blanket were knitted on the back side with the stitches P3, K1, P3 (purl 3, knit 1, purl 3). There are six of these squares in each row of the grid. I knitted my code on the back side so that the words would go from left to right. I coded letters into each square this way: P1, next two stitches are first digit of letter, K1, next two stitches are second digit of letter, P1. Z: 101: k2 p2 k2. When I had the blanket all finished, ends sewn in, and I laid it out to take pictures — I discovered I’d left out a word! Urgh! But it’s still a Blessing Blanket. And I still thought about and prayed for Alyssa as I knitted. And it’s still warm and soft. I’m not going to say what word I left out, because I want to see if the baby’s parents can “read” it well enough to figure out! (I’m bad!) Astute readers of this blog who possess really really good eyesight might be able to tell as well. Since the stitches are done on the purl side, k2 gives you straight bumps. So A = p2 k2 gives you a smooth panel, then bumps. L = ykt ykt gives you a hole from the yarnover, then two stitches together, in both sides. On the second row, K = ykt k2 combines both of those. Then we have A, which looks just like the first A. The third row has the same combination reversed in G = k2 ykt. Then R = sky sky. 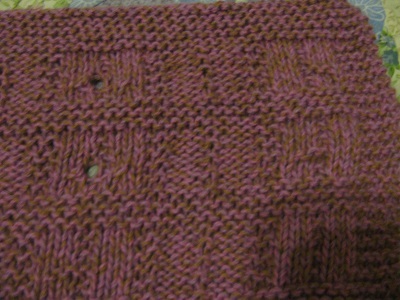 With sky, the stitches are knitted together before the yarn over, so the hole is on the right of the combined stitches. Y = k2 p2 p2, so I started on that first stitch I usually leave a purl stitch. 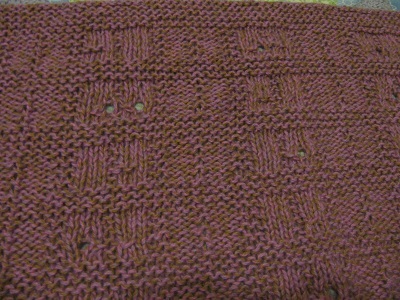 So it looks the same as A, only shifted over one stitch to the left. S = sky cb shows us our final “digit”. The cable in back comes out as one stitch going over another with no hole. The second row is easier to see. R = sky sky, so you can see both sides have the hole on the right. 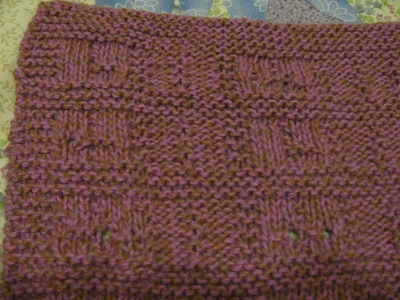 Then I = k2 cb, and you can more easily see the cabled stitch crossing over. On the third row, we have A = p2 k2 and C = p2 sky. The fourth row, the end of the word AND, gives you a nice look at the cables again, with N = ykt cb and D = p2 cb. Making this was so much fun! In fact, I’ve been dragging my feet about sending it on. But tonight I noticed that the yarn label happens to have a pattern for a one-skein scarf, and I happen to have one skein left. So perhaps making myself a scarf out of this wonderful 85% cotton 15% angora yarn (Serenade) will remind me to send thoughts and prayers and blessings to my sweet little niece, Alyssa Karise. And, meanwhile, my brother announced that his wife is expecting a baby. His baby needs a prime factorization blanket! I am swatching to figure out how best to accomplish this, and will definitely be letting my readers know! This entry was posted on Saturday, November 17th, 2012 at 9:36 pm and is filed under Knitting, Mathematical, Prime Factorization. You can follow any responses to this entry through the RSS 2.0 feed. You can leave a response, or trackback from your own site. A friend of mine sent me a link to your factor sweater, and i looked about and found this post. I’ve made a coded message square–take a letter, look up the ascii code, then change the ascii into binary, and the binary into knits and purls.. I love math based knitting–have you read Debbie New’s book Unexpected Knitting? she has some marvelous ideas–(i knit some) and long before i knew it as celular automaton, I was knitting color work patterns that I just called formula knitting– Happy knitting (and be prepared for a bump in readership, I shared the link i had to your blog.. and i know others will share it, too! Wow! That’s cool! I will look up Unexpected Knitting! And just a few minutes ago, I posted about my latest mathematical knitting — http://sonderbooks.com/blog/?p=25603 That’s amazing timing!